In October, I paid my first ever visit to County Clare, on Ireland’s west coast. I had heard so much about the beauty of this part of Ireland, that I was very excited, as my ferry crossed the river Shannon from Talbert, in County Kerry, to Kilrush, where I alighted in Clare. On driving my hire car off the ferry, I headed northwest, up towards Ballyvaughan, where I knew the Atlantic coastline was at its most wild and rugged. County Clare is home to The Burren, a dramatic karst landscape, which features limestone pavements filled with cracks, known as “grikes”. The limestone was formed as sediment of a tropical sea some 350 million years ago, while the grikes were left behind the last ice age, the Midlandian Ice Age, between 80,000 and 13,000 year ago. “The West Coast of Clare” also happens to be the name of one of my favourite songs by the great Irish traditional group, Planxty. Here’s a link to it. If you listen to it while reading this blog and looking at these images, you might just feel transported to the wild West Coast of Clare. This song played on a continuous loop in my head throughout my time in Clare. Indeed, I suspect that, much of the time, I was singing it out loud. 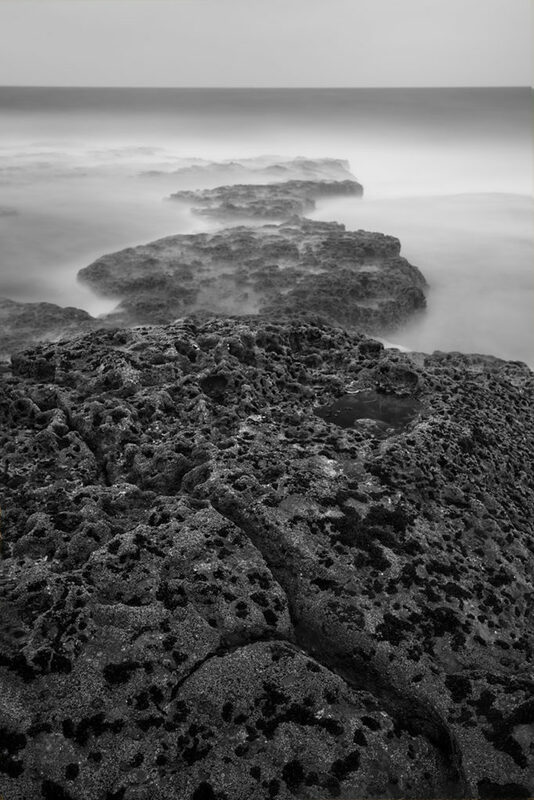 The dramatic limestone rocks are filled with fossils of corals, sea urchins and ammonites. The area takes its name from the Irish word “Boireann”, meaning “rocky place”: there could be no more appropriate term for this part of Ireland. While I had a few specific destinations in mind that I wanted to visit, primary amongst them the Cliffs of Moher (more of which in a future blog post), I was happy to spend my first day in Clare just driving around the northwest coast of the county. 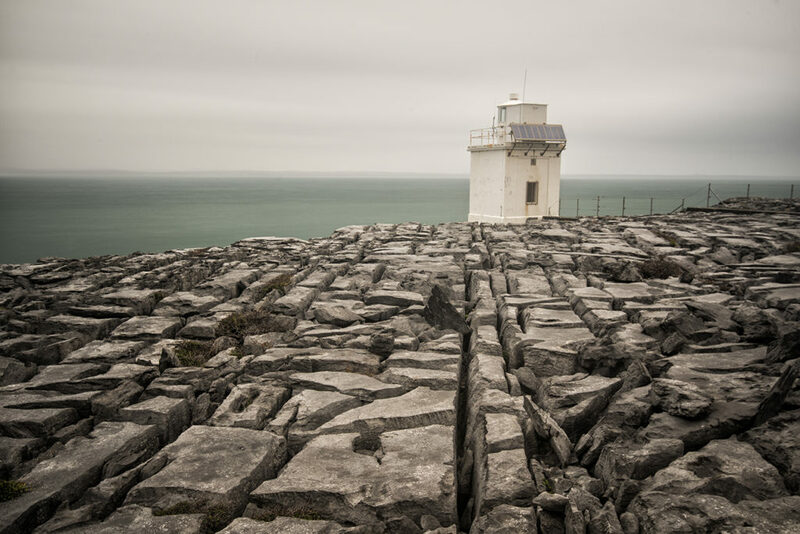 I found a pretty, little lighthouse (second image) near the hamlet of Fanore, where the cracked limestone on which the lighthouse sat provided dramatic lines, running out towards the light, which I was able to use in my composition. On the coastline south of Fanore, I parked my car and walk a good twenty minutes from the road out to the water line, where the Atlantic meets the limestone shore. It was a treacherous walk, as some of the grikes are more than two feet wide and several feet deep. I took my time and picked my way gingerly across the rocky shoreline, out to the water’s edge. Once there, the next danger was from rogue waves, which sprang up higher than I was expecting and threatened to cut off my retreat. The wild Atlantic Ocean is always unpredictable when it slams into the rocky coastline on the west coast of Clare. I lingered long enough to make the first image, a four minute long exposure, again using a large grike as a leading line into the image. 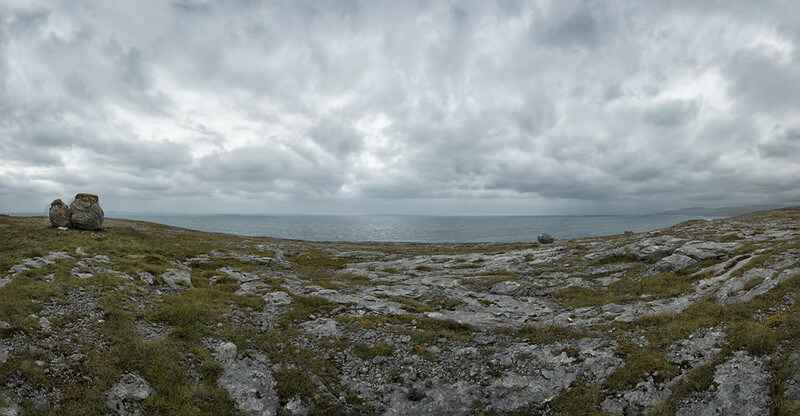 The final image is a panorama of the foreland near Fanore, showing one of the “clints” or large, limestone boulders, which are strewn all over this remarkable landscape. And that is exactly what gives the West Coast of Clare its unique beauty.